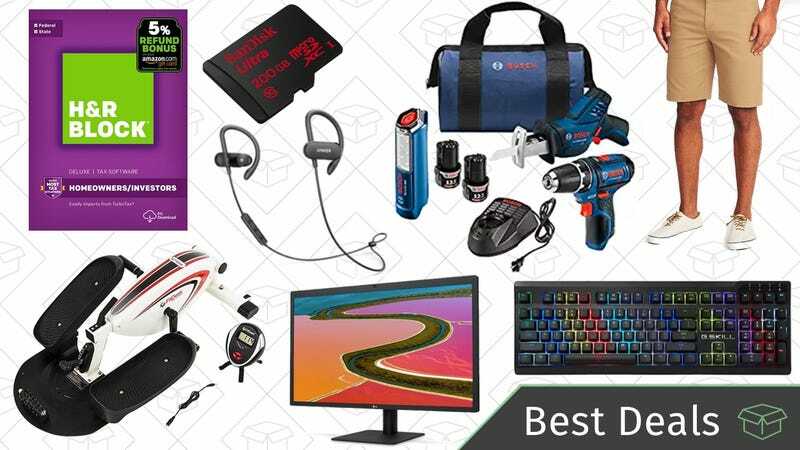 Upgrade to a 5K LG monitor, gear up with a Bosch tool combo kit, finally file your taxes, and find the rest of today’s best deals. You can never have enough flash storage, especially when you can fit 200GB of files on a card the size of your pinkie nail, all for $62, a solid discount from its usual ~$73. This would be perfect for those massive Nintendo Switch games, or for popping into your phone, dash cam, or GoPro. We saw this drop as low as $60 last month, and $50 during a one-Day Gold Box deal during Black Friday, but this is still a very solid price for this amount of storage. USB-C Power Delivery battery packs are magical devices that can charge MacBooks and Nintendo Switches no matter where you are in the world, and one of the most popular options out there is on sale today with promo code 26800MON. $56 gets you RAVPower’s 26,800mAh battery pack, complete with a 30W USB-C port that can power a MacBook or Nintendo Switch at basically full speed, plus two regular USB ports as well, making it the ideal companion for a long flight. Anker’s PowerPorts are our readers’ favorite multi-port USB chargers, and today you can get their powerful 60W, 6-port model for $22, down from its usual $28. That’s enough ports for your phone, your tablet, your Kindle, your smart watch, your Bluetooth headphones, and a Bluetooth speaker. Tile improved on its ultra-popular device trackers by adding waterproofing, customizable ring tones, increased range, and a more durable design to its new Pro series. At just $18 each, you can get four Tile Sports, while they last. Twelve South’s Fermata is the headphone charging stand for the age of Bluetooth. The stand has a short (i.e. non-tangling) microUSB cable built right in for your headphones, plus an extra USB port for your phone, tablet, or anything else that charges over USB. $63 is an all-time low, but we don’t expect it to last for long. Anker’s SoundBuds Curves were a runner up in our recent affordable headphone poll (they were only beat out by Anker’s own SoundBuds Slims), and you can grab a pair for just $21 today, down from $28. The SoundBuds Curve are the sportiest member of the SoundBuds family, and are designed with active users in mind. Their ear wings ensure they stay put while you exercise, and an internal hydrophobic coating means your sweat won’t fry them. Their best spec though? 12.5 hours of battery life, which is basically unheard of in the space. Even if you already have Bluetooth headphones you like, it might be worth grabbing an extra set to keep in your gym bag. The advent of USB-C is largely a positive force in the world, but it does mean that the days of just plugging an HDMI cable directly into a computer are coming to an end. So when you want to connect your laptop to a TV or projector, this $16 dongle is exactly what you need, and nothing more. Get it for $16 today with promo code KINJAUC1. Before you embark on your next home improvement project, check out this Bosch combo kit, on sale for about $60 less than usual in today’s Gold Box. $139 gets you a compact drill/driver, a handheld reciprocating saw, a work light, and a couple of batteries to power them. These 12V tools aren’t the most powerful you can buy, but they’re small, lightweight, and strong enough for most tasks around the house, as evidenced by a 4.6 star review average from over 400 customers. This kit has sold for $200 since it was released last year, so today’s deal is the first we’ve ever seen. You can’t put it off much longer, folks. Taxes are due in less than two weeks, but if you still haven’t filed, Amazon’s rewarding your procrastination with a fantastic deal on H&R Block Deluxe + State. $18 is an all-time low price, and you can even choose between a disc or a download. Unfortunately, this deal only applies to the Deluxe tier, so check this chart to make sure it’ll work for you before you buy. Update: If you missed this $115 deal earlier in the week, here’s a similar option for just $5 more. Somehow, it’s still winter on the East Coast, so you’re probably feeling anxious and tired, a general malaise if you will. If you need a break from all the craziness and just can’t get your brain to turn off for one second, you’re gonna want to check out a weighted blanket. This 15lb, queen-sized one is down to $115 with the code RNX6O62Q. Just trust me on this one. If you haven’t replaced your metal spring mattress with a giant block of foam that you bought on the internet, what are you even doing with your life? Amazon’s currently marking Sweetnight 10' gel memory foam mattresses to under $430. Featuring a dual-sided system (one side is a pillow top, the other is firm), a queen will run you just $329 and a king is $411. Most of us know letting wine breath will make it taste better. This $11 aerator will speed up the process by mixing in air as your pour. I have one of these at home and it honestly makes a noticeable difference, normally taking out the initial harsh acidic taste of some wines. Cool more cookies without sacrificing counter space. This normally-$20 3-tier cooling rack will set you back just $14 today. Plus, it folds flat for easy storage. Pad the floor of your home gym, workshop, or playroom with these foam tiles. They’re lightweight, water-resistant, and easy to clean up. A 6-pack of 2' x 2' gray tiles is just $20 today, which is about $4 less than the typical price. It’s not the sexiest vacuum out there—you still have to plug it in, in the year 2018—but the Bissell CleanView has terrific reviews, and includes a washable filter and a powerful TurboBrush tool for furniture. It’s been a hit on Amazon at its usual $70-$80, but you can get it for an all-time low $60 in today’s Gold Box. If you’re a fan of Starbucks’ caffeinated Refreshers, today is your lucky day. Amazon is offering 20% off these 12 packs - one is a variety pack with strawberry lemonade, black cherry, and peach passion fruit flavors for $17, and the other is 12 cans of black cherry limeade for $15 after the coupon’s discount. The black cherry limeade coupon is applicable to Subscribe & Save orders only, just remember to cancel your next order if you don’t want multiple shipments. If you can’t find the time to get to the gym every day, this under-desk elliptical lets you squeeze in some light exercise while you fill out your TPS reports. This typically sells for ~$100 on Amazon, and today’s $80 deal on Woot is the best price we’ve ever seen since Christmas. Even without discounts, Dorco offers some of the best deals in shaving, and now you can try their six-blade Dorco Pace 6 razor for just $10, complete with a handle, six cartridges, and even some shaving cream. Just use promo code KINJA43X at checkout to save $10. If you haven’t yet treated your fingers (and your ears) to a mechanical keyboard, this G.Skill Ripjaws KM570 has an $18.70 clippable coupon on Amazon today, bringing it down to $77. With full RGB backlighting, custom profiles, and Cherry MX Red key switches, you won’t be hurting for features. The Humble Monthly clock is about to reset again, so you only have two days left to get in on April’s selection. Sign up now for $12 per month to get Deus Ex Mankind Divided, Mafia III, and God Eater II, plus whatever other games unlock on Friday. And yes, even if you cancel your membership, every game you got is yours to keep forever. There’s nothing fancy about this gadget stand, but it’s only $11 (with code KAO9JR4B), you can adjust its angle, and it lets you charge the Switch while you play it. What more could you want?